You've probably heard it before: we've got a long way to go in finding artful ways to meld great storytelling with the traditional mechanics of digital games. Being a computer scientist, I usually see the attempts of improving the state of the art from the technical perspective, but this past weekend I got to learn more about what the humanities researchers in academia and the writers, artists, and designers from industry have been doing at the Experiencing Stories with/in Digital Games colloquium held in Montreal. You can read the rest of the post, and check out my live notes online (please excuse spelling, grammar, and formatting issues). We are currently working on patterns to control only one layer. 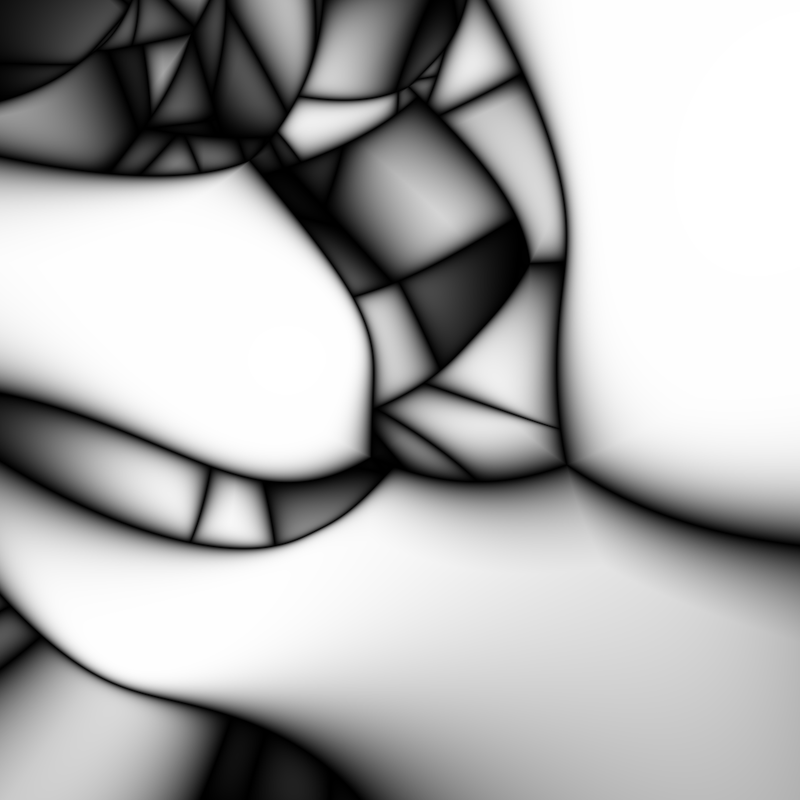 The previous images were made by distributing points and colors randomly. Once we will be able to control perfectly the patterns on one layer, the hierarchy itself will be easy to do. And here's a first pattern that I've managed to do quickly. This is only one layer... with very few control points. Four for the center, one per petal and 10 for the surrounding. 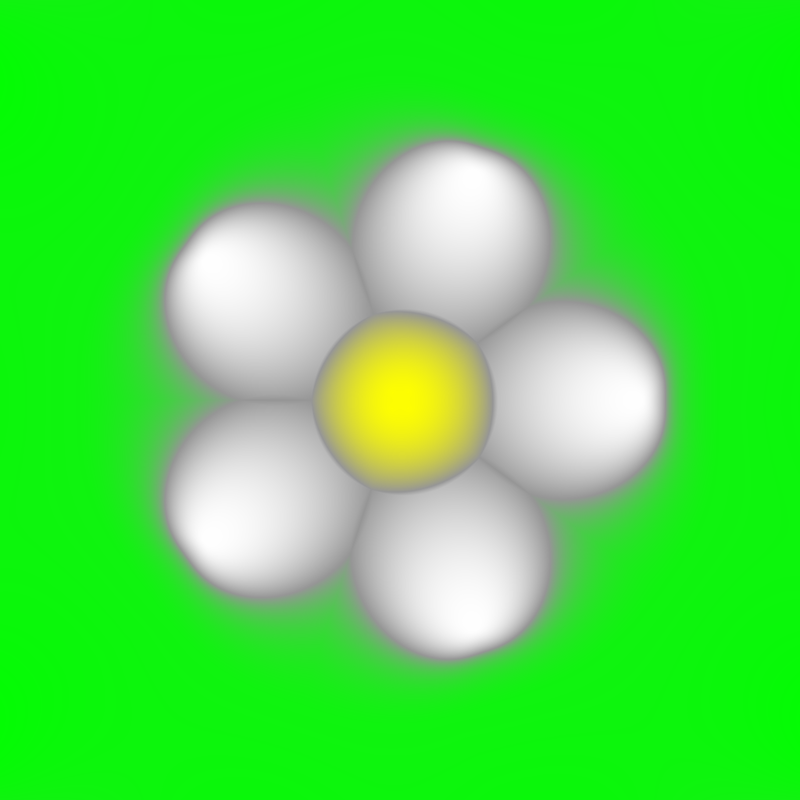 So 19 points to create a very simple flower. Non-linear fiction ranges from the use of static plots with events presented in a non-chronological way to interactive story worlds where users make choices that affect the outcome of the story. A wide range of media can be used to implement works of non-linear fiction, including novels, film, storytelling engines, and games. In all of these cases, there are multiple techniques available for designing and telling a non-linear story. We have compiled a taxonomy for these techniques with broad categories for strategies for explaining non-linearity, structuring stories as graphs, relying on emergent behaviour, creating character driven plots, and designing data-driven interactive worlds. Each of these categories breaks down further with classic examples from all types of media and with approaches reported on in academic literature. For instance, a strategy to explain a story’s non-linearity is to attribute it to time travel (The Legend of Zelda: Orcarina of Time) or to a hallucinating or brain-damaged character (Memento). Many examples use a simple branching structure to change the story based on player choices (Choose Your Own Adventure) while others rely on game data to adjust how other characters in the story react to you (Fallout 3). In this talk, we will present our taxonomy and frame it in the context of story in games. We will discuss what techniques have been used in existing games, and which have not yet been employed. We will consider why games have not used certain techniques, and use this to suggest how they might do so in the future. A few weeks ago, Gail Carmichael linked me to a collection of articles dedicated to narrative in the digital space, including non-linear stories, and how creativity has been changed through new technologies. I plan on posting my impressions from these articles here, summarizing how they relate to the Creativity Enhancement Project. This first article is one that reviews the state of story generation software, and their underlying engines. Early in the feature, we are presented with a very important point regarding the importance of narrative itself. While most studies and software focus on applications for entertainment and crafting fiction, there is a wider perspective that is often missed. Narrative is more than a story. It is universally known and used cognitive model, whose structure allows us to understand diverse and convoluted concepts. While this fact isn't typically acknowledged, it still means that this sort of technology could have wide reaching applications. The narrative structure is one that is crucial to human understanding and communication. It is the model usually used when describing and analyzing concepts in any and all topics. There may be countless other methods to structuring these ideas, narratives are usually how we choose to represent them. Quickly, the article identifies it's guiding taxonomy; one from Boden (Source). It is one that categorizes two kinds of creativity; Exploratory Creativity and Transformational Creativity. Exploratory Creativity is defined the process of searching a conceptual space, one that is already governed by specific rules and boundaries. Whereas, Transformational Creativity involves manipulating these rules and extending the boundaries of a conceptual space, in order to find new territory to explore. This distinction is a very interesting one to make, and it is one that neatly identifies the focus of the Wordplay prototype. For most existing story-planning/creativity enhancement software (including all the examples in this article), they exclusively work within a set, user-defined world state. This manner of assistance falls squarely into Boden's exploratory creativity. This is definitely a valuable area to provide assistance in, but the notion of transformational creativity is entirely ignored within the design of these programs. This focus on exploratory rather than transformational creativity is a counter-intuitive strategy when it comes to crafting a narrative. For one, it assumes that the process of transformational creativity is complete. It works only in the context of a concrete world state; one whose rules and boundaries are set, and do not require revision. To me, this seems like a major fallacy when looking at the nebulous nature of creating fiction. There is always room for transformation when it comes to creating an interesting story. In fact, it is rare to see creative work follow the original conceits or goals. There are numerous examples of books, films and games departing significantly from the first envisioning. In fact, forcing a set world state from the start doesn't seem to match well with a goal of "creativity enhancement". Additionally, the story-engine itself is focused on "pathing" between specified world states in an "acceptable" manner. By "pathing" I am referring to determining plot and character actions which drive the world to eventually meeting a desired/inputted outcome. This method is crafting stories backwards in a sense. The proverb "Focus on the journey, not the destination" applies very aptly to creating any fictional story. A creator should be interested in the arc of the plot and characters rather than their outcome. Ultimately, that is where the drama and moments that narratives are built on come from. Stories are in and of themselves journeys, and that is where true creative effort should be applied. These are fine metrics to check against in order to create a comfortable and cohesive story. However, if your goal is make a creative and original story, these parameters won't serve you well. The insistence on creating stories within specified and established tropes/expectations is entirely counter-productive. If anything, these parameters stifles creativity, rather than enhance it. Creative and original stories, are ones that can defy and question existing expectations or norms. In many cases, the predominate genres of games (fantasy and science fiction) are ones founded on providing a thought-provoking perspective on a contemporary issue. If your main goal is conforming to set expectations and norms, it would be difficult to come up with a profound theme within your narrative. Another major issue presented by present story-engines is that the construction and specifications required for a world state are prohibitive for most users. Regardless of the underlying engine and algorithms, the level of minutia required to populate the world state and required parameters is a trying task to approach. This obstacle, while a necessary evil for present programs, creates a sizeable obstacle for writers. This sort of challenge is one that hinders a creators output at one of the most crucial points in developing a story. Rather than focus on transformational creativity, a user is forced to put their attention on meeting the criteria of the software instead of cultivating their preliminary ideas. It also doesn't allow a writer to organize and build their stories by their terms. There are countless different methods that writers use to organize their creative processes. It is important that the software be as accommodating as possible. Having an ornery requirement for meeting predefined structures and expectations is going to be restrictive to many creators. Once again, this system is one that ultimately limits the conceptual space a creator is working within, rather than expanding it. Forcing structure on early narratives doesn't really serve as good direction for creativity. What it does is immediately stifle processes of transformational creativity and force a preliminary story into a comfortable and familiar mold. Judging from the examples presented in the article, it seems clear to me that present story engines have made impressive achievements as well as leaving some startling oversights. The algorithms and programs shown have truly amazing capabilities. They can understand and apply some core story structures, as well as give meaningful suggestions in certain contexts. The oversights and problems of these programs seem to be ones centered around a misunderstanding of the creative writing process and philosophy. While their toolset certainly could be helpful at specific development points, for the most part the barriers to entry and unyielding focus on structure make these story-engines useless as a tool for enhancing creativity. Ultimately, I feel that these failings show that there is a place for a program like Wordplay. One that focuses on transformational creativity, allowing for unstructured and unfettered brainstorming. But, as you might imagine, there is a big divide in opinion on gamification. Check out Sebastian Deterding's Coding Conduct post on his keynote presentation, Don't Play Games With Me! Promises and Pitfalls of Gameful Design. The slides from his talk are embedded below and are worth reading through. Imagine finding yourself in the front foyer of what is probably a haunted mansion with a few of your closest friends. There's no way out, since the front door is locked (naturally). You begin to explore the house, discovering one new room at a time. You might run into some unexpected circumstances, halting your exploration temporarily, or find some items that might be useful to you later. Read the rest of the post and find out how this game fared in the interactive storytelling department. How Important is Interactive Storytelling in Educational Games? Story in games. Something we seem to be trying for, but continue to struggle with. Perhaps it's even worse for educational games: we are told that narrative engages learners and helps to situate content, but it's not clear whether we need a full fledged story instead of just a little bit of fiction to accomplish our goals. Worse, get it wrong, and your audience could see through it and dismiss the whole idea since they know you have an educational agenda. My mind has been occupied by narrative lately. I've been surveying literature about non-linear / interactive narrative and storytelling with the goal of eventually coming up with new strategies for piecing together story fragments in an interactive story. In particular, I'm interested in how this could help in the context of educational games where designers have a specific learning objective in mind. Since my husband and I have been working through L.A. Noire lately (which I love! ), I've been thinking about how linear the story has been (especially for an interactive video game). I wrote a complete blog post summarizing the event on my own blog, which was also syndicated on BlogHer, which I encourage you to check out.